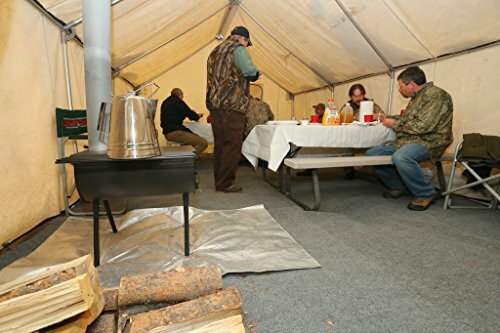 Groups who spend a significant amount of time in the backwoods, as well as families who like to take long camping vacations often debate about the best way to provide heat and cook food. This can especially be an issue for fall hunting trips or rustic retreats. To help groups meet these needs Camp Chef offers their Alpine CS14. 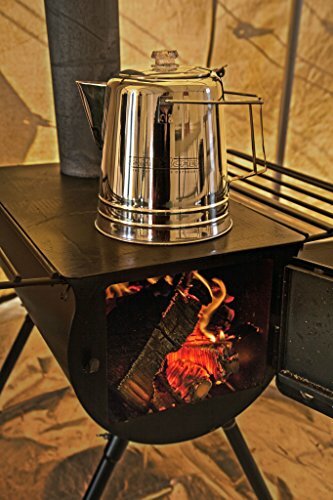 It was specially designed to be versatile enough to be used as a wall tent woodstove as well as a camping cook stove. 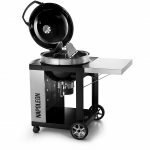 It can handle a basic wood fire or charcoal briquettes. The Camp Chef Alpine CS14 was also designed to be very portable. All its components including the optional nested chimney, ash grates, and legs fit neatly inside. When you first get the stove, you will need to perform a basic “Burn-In.” This should be done outside and not in a tent or other enclosed area. The process calls for attaching the legs and the spark arrestor, as well as nesting a short section of the stove pipe. Then you should start a modest fire inside the firebox. While a wood fire is just fine for this, you will get more consistent heat from 2-3 pounds of charcoal briquettes. Then adjust the damper to maintain a moderate burn. The exterior of the stove will start to smoke as it burns off the layer of protective oils applied by the manufacturer. It will also cure the paint, change is from glossy black to more of an eggshell or flat finish. The five-inch chimney pipe was designed to fit into the ceiling of a classic wall tent, to give backwoods campers and hunter a means of heat and cooking fire. 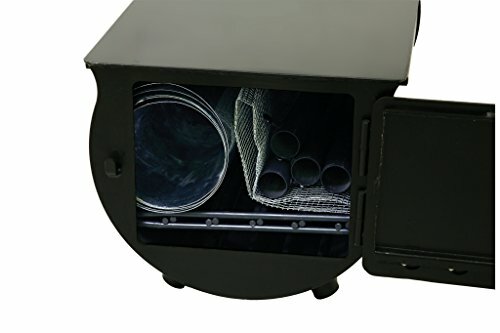 It is also an ideal size for fitting into an ice fishing shanty. However, it can also serve as a basic cook stove for family camping vacations, where a fire pit might not be available. In a situation like this you would simply keep the chimney pipe short. 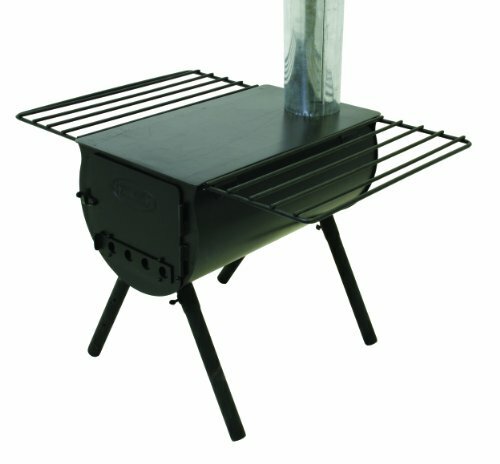 The Camp Chef Alpine CS14 also comes with hanger racks that can be attached to each side. This is a handy feature for drying wet socks and other damp clothes. Just keep in mind that if you cook food on the top while trying to dry wet clothes, you will likely get spatter on your clothing. The Camp Chef Alpine CS14 is made from durable thick gauge steel. While the legs are not directly welded onto the firebox they still very sturdy once they are installed into their sockets. Setting up the chimney can take some time if it’s your first time installing it into a wall tent or a shanty. Be sure to read your wall tent’s owner’s manual for specific installation details. 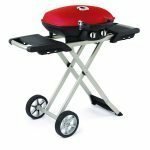 While the Camp Chef Alpine CS14 does come with a spark arrestor, it’s also a good idea to place a sheet of tin under the legs and in front of the door, or make sure it’s sitting on bare ground. As with all camp stoves it can take a little while to get used to the way it burns. Which can also vary depending on how long you go without removing excess ash. If you fully open the dampers on the Camp Chef Alpine CS14 the fire inside will roar, which can be handy for heating things up first thing in the morning, while also percolating coffee or getting enough heat to cook breakfast. The top of the stove is not specifically meant for direct cooking. If you want to use it as a griddle you can buy a cast iron griddle that’s been coated with non-stick porcelain. The cast iron will absorb the heat from the cooktop, to give you a consistent temperature, while the porcelain coating will make for easy cleanup. If the fire is modest, you can also open the door for a short amount of time to roast hotdogs or marshmallows over an open flame. Just keep in mind that this will introduce a lot of oxygen to the fire, which will accelerate the burn within a few minutes. If you are going to be packing out for a day or more with the intention of coming back and you want to leave the stove and wall tent in place, you should slip a sheet of heavy-duty tinfoil inside the door behind the dampers. Even though the dampers and door close relatively tight, once the fire goes out the natural draft of the chimney can transfer some of the wind into the firebox. While it won’t kick out any glowing ember, it can introduce a bitter ash smell and fine dust to the wall tent. The small sheet of tinfoil will block this from happening. Not counting the collar of the chimney, the Alpine CS14 measure 24-inches long by 14-inches wide, for a cooking surface that is a little under 336 square inches. I would recommend getting a 16 to 18-inch cast iron griddle to pair with the cooktop for a consistently heated cooking surface. The attachable drying racks are handy for drying wet socks and damp clothes. They measure 22-inches by 7 inches. With some careful draping, they can help dry a wet shirt, but they really are meant to dry smaller articles of clothing like socks, gloves, and hats. Like all camp stoves ash management becomes increasingly important the longer the longer the fire lasts. If you are going to use the Camp Chef Alpine CS14 to heat a wall tent over a weekend or a week-long hunting trip, you will want to keep a small metal bucket and a scoop nearby to remove some of the ash every 8 to 12-hours. If you are simply going to use it as an open-air cook stove, you should scoop out some of the ash each day. When it comes time to pack the stove up to take it home, you want to make sure the fire is completely out. Suffocating the fire is the safest option, yet it also takes the most time. Another option is to open the dampers fully and let the fire burn up all the charcoal or wood. You can then scoop out any ash and embers into a metal bucket with a little bit of water. You should never put water in the firebox as ash and water can cause corrosion issues. Once everything is cold, you can uninstall the chimney and legs, and simply dump out any lingering ash. I would also recommend covering the door and chimney collar with heavy duty tinfoil to prevent ashen dust and odor from escaping while the stove is in storage. The Camp Chef Alpine CS14 comes with a 1-year manufacturer’s warranty on all parts and components. Choosing a cookstove for your wall tent or campsite is one of the critical components for comfort and convenience when you’re in the great outdoors. The Camp Chef Alpine CS14 offers thoughtful design married to quality components. 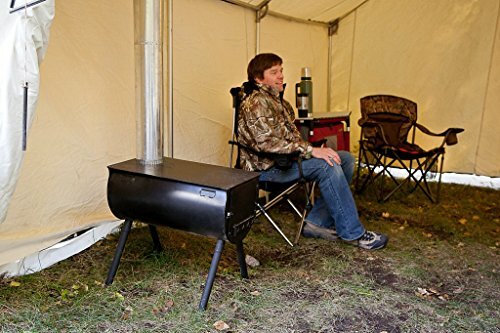 With some thoughtful maintenance and a few basic accessories, it can help keep you warm, dry your clothes, and give you a place to cook your meals, without having to waste time wrestling with cooking over the campfire pit.